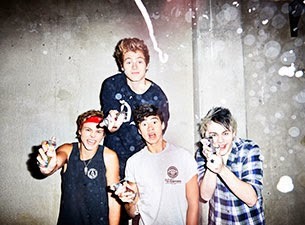 Are you excited as much as us for 5 Seconds Of Summer's upcoming North American tour?! Well, today is your lucky day. ATP! has teamed up with Live Nation to give our readers the chance to win a pair of tickets to a date of their choice (list of select dates can be found below) to the band's highly-anticipated "Rock Out With Your Socks Out" this summer with Hey Violet. 3) Tweet: "Hey @AlterThePress! I want to win tickets to see @5SOS in [city, state of the show you would like to attend] #5SOSATP"
The contest closes Friday, June 5th. Winners are selected at random. Good luck! Tickets for 5 Seconds of Summer's "Rock Out With Your Socks Out" tour are available now can be purchased here.